It will be held on Sunday, 19th November. 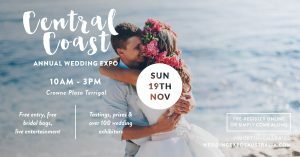 There will be over 90 of the Central Coast’s most creative and popular wedding suppliers and vendors. The Expo has an upbeat, modern, trendy vibe, full of colour, inspiration, fun and great live entertainment. FREE entry plus the first thousand Brides receive the exclusive ‘I’m Getting Married’ Bridal Bag. What better way to plan your perfect day and get some great ideas. We would love to see you there and come in and try our booth.